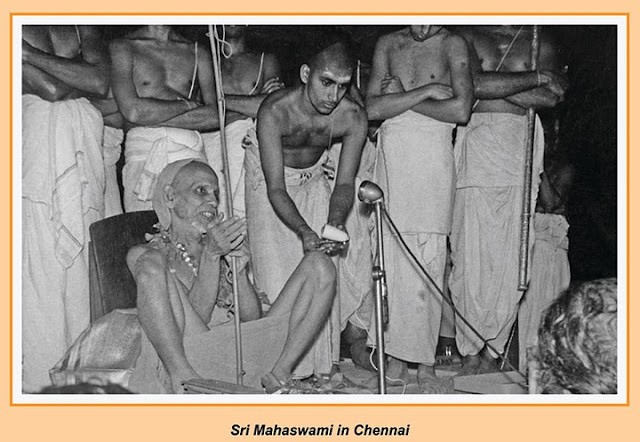 Only after taking up SannyAsa one gets the eligibility and right to receive the teaching of the mahAvAkyas that the Vedas proclaim in forms like "This Jiva itself is Brahman". Since the Vedas which are verily Brahman themselves declare Jiva as Brahman the mahAvAkyas get that exclusive spiritual power. Just by knowing well that Jiva is brahman and by meditating on that will not make that goal a fact of experience. That declaration has to be repeated as a japa through the conglomerate of the letters of these veda-mantras and has to be meditated upon as a regimen; that is what makes the goal accessible. ‘Accessible’ does not mean ‘easily accessible’! I only said it in a comparative sense. Thanks for your note. In one of my earlier posts, I had mentioned the source - the current series is based on the translation of Periva's discourses done by Prof V K, and is aimed at reaching all general public (non-tamil readers), who can get to understand and cherish Periva's messages. Hence, am continuing to post only in English on the blog. If you are not already a member of the groups at www.periva.org, please do so wherein there are lot of articles circulated by members in tamil as well as english - in which you can really enjoy the exact words and accent of Periva. Thanks for your comment and wishes.